They'll always have Paris. 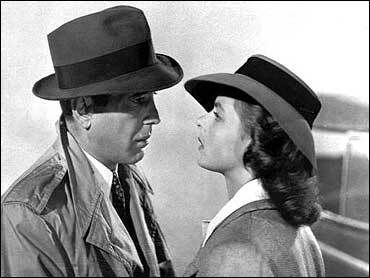 Now Rick and Ilsa have the top spot on the list of best American screen romances. "Casablanca," starring Humphrey Bogart as saloonkeeper Rick Blaine and Ingrid Bergman as his lost love Ilsa Lund, came in at No. 1 on the American Film Institute's top 100 U.S. love stories announced Tuesday on the CBS special "AFI's 100 Years ... 100 Passions." The rest of the top 10, in order: "Gone With the Wind," "West Side Story," "Roman Holiday," "An Affair to Remember," "The Way We Were," "Doctor Zhivago," "It's a Wonderful Life," "Love Story" and "City Lights." "I think the films that haunt you the most over time are love stories," said Sydney Pollack, director of "The Way We Were" and the No. 13 film, "Out of Africa." "Many, many films haunt you, but you get haunted in a way that's hard to shake off when you're watching star-crossed lovers who you really care about and who get under your skin, like Bogart and Bergman. That's a story that's just irresistible." Cary Grant led actors with six films on the list. Besides "An Affair to Remember," they were "The Philadelphia Story" at No. 44, "To Catch a Thief" at No. 46, "Bringing Up Baby" at No. 51, "The Awful Truth" at No. 77 and "Notorious" at No. 86. Katharine Hepburn, Grant's co-star in "The Philadelphia Story" and "Bringing Up Baby," was the most represented actress, also appearing in six films. Her other entries were "The African Queen" at No. 14, "On Golden Pond" at No. 22, "Guess Who's Coming to Dinner" at No. 58 and "Woman of the Year" at No. 74. Besides "Casablanca" and "The African Queen," Bogart starred in three other films on the list: "Dark Victory" (No. 32), "Sabrina" (No. 54) and "To Have and Have Not" (No. 60). Bogart's "Sabrina" co-star Audrey Hepburn also was in five films, including "Roman Holiday," "My Fair Lady" (No. 12), "Two for the Road" (No. 57) and "Breakfast at Tiffany's (No. 61). The oldest film was "Way Down East" from 1920 at No. 71. The newest was "Shakespeare in Love" from 1998 at No. 50. The film institute began issuing annual lists on different movie themes four years ago. The love-story list was chosen by about 1,800 directors, actors, studio executives, critics and others in Hollywood, who voted from a field of 400 nominated films. Finalists ranged from the giddy comedy of "When Harry Met Sally ..." (No. 25) and "It Happened One Night (No. 38) to the tragic affairs of "Wuthering Heights" (No. 15) and "Titanic" (No. 37). What makes for a great love story? "At the end of the day, it's what happens between a man and a woman on the screen," said "When Harry Met Sally ..." director Rob Reiner, who placed two other films on the list, "The American President" (No. 75) and "The Princess Bride" (No. 88). "It's a very different approach to that in all three cases with my films." "The Princess Bride" is a fanciful, love-conquers-all fairy tale, while "When Harry Met Sally ..." was a personal story based on Reiner's experiences when he was "thrown back into the dating pool after being married for 10 years and making a mess of the whole thing," he said. "American President" is a modern Cinderella tale about "what would happen if you ever really dated the president," Reiner said. "This was before Monica Lewinsky, when people didn't date the president so quickly." Reiner's three entries have happy endings, but a surprising number on the list do not. The lovers clearly wind up together in only two of the top 10 films, while a third, Charles Chaplin's "City Lights," has an ambiguous ending. "Ironically, in these 100 movies, they don't necessarily walk out hand and hand into the sunset," said Jean Picker Firstenburg, the institute's director. In "Vertigo" (No. 18), James Stewart watches Kim Novak fall to her death — twice. "King Kong" (No. 24), ends with a giant dead ape, "Bonnie and Clyde" (No. 65) ends with a bullet-riddled couple. "The English Patient" (No. 56) finishes with a dead burn victim, "Harold and Maude" (No. 69) closes with a young man on his own after his elderly lover's suicide. "When there's real closure in a love story and it's resolved in a happy way, it doesn't reverberate as much afterward," Pollack said. "That's been true from Greek tragedy on, from Shakespeare on. Romeo and Juliet, Tristan and Isolde, Heloise and Abelard. Many great love stories have been about unobtainability."